The publication of this book confronts me to THE elementary issue at the core of economics: how to best allocate scarce resources? My editor has sent me 10 free copies of the book. What shall I do? Option 2 => Reward friends, out of my political discretion. This option is tricky. Assuming I have more than 10 friends (I guess I have), how to pick those that should receive the book without p****g off disincentivizing other from being my friends? Congratulations on this release! (I’m impressed). Option 5 – Auction copies signed by the author ? Option 5 : choose the most worthy or most deserving….but by what measure? You can send me some copies of your book. I’ll write a review. “A hilariously entertaining book and a must-read not only for antitrust lawyers, competition law practitioners, economists, antitrust government officials, and politicians worldwide, but also for the regular guy on Main Street.” [10 copies]. Option 5: Run a tombola. 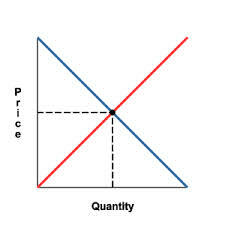 Let’s replace ‘quantity’ represented on the abscissa with altruism and ‘price’ on the ordinate with ‘self-interest’. Apparently more books to the school library would imply a higher level of altruism and a lower satisfaction of the self-interest. This is not necessarily true or is it? Though, I am more interested in the last option. The degree of altruism equals zero, but also the self-interest will approach the origin. It would actually constitute a paradoxical choice in economic terms and it will be in fact similar with Paul Cézanne’s moments of doubt and reflection in front of a new painting. In these challenging moments having more than ten friends may help a lot 🙂 Congratulations for your new book!